Practical conclusions and recommendations based on specific technological and other results of work on commercial mastering DC arc furnaces of the new generation are given. Such furnaces have no alternative in respect of implementing solutions of a complex of problems allowing to assure metal quality that is hard to achieve on other furnace types. In 2005 the OAO Metallurgy Research Institute having scientific departments and a large ferroalloy shop has developed, introduced and certified a quality management system as applied to the production of inoculants and master alloys for compliance with GOST R ISO 9001-2001. The maximum possible satisfaction of customer requirements has been accentuated. The supply of inoculants and master alloys to machine builders is accompanied by the obligatory scientific and methodical support of the process of assimilating new kinds of products on the part of the OAO NIIM (Metallurgy Research Institute). Efficient methods of sampling that ensure higher accuracy of controlling chemical composition and reliability of financial settlements with customers for the products supplied have been developed and certified. FeNi, CuNi and Ni based inoculating compositions for complex inoculating treatment of ductile iron used in the production of rolling mills cast rollers and other critical cast parts have been developed and successfully introduced into production practices of NEK Ltd. and other production companies. The hereditary effect of charge on the pre-shrinkage expansion of the AK7ch alloy is discussed. It has been revealed that use of a charge having finer grain structure intensifies the shrinkage processes, reduces the pre-shrinkage expansion and improves the quality of the alloy produced. The achievements, the main trends of the development, scientifically -technical problems and prospects of expansion of using in industry of the composition and the nanocrystalline materials with essential advantages in contrast with traditional materials and alloys : high specific toughness, dimensioned stability under raised temperature, wear capability or unique combination of the specified and others physico-mechanical characteristics are considered. The examples of successful and efficient industrial using of the composites in high loaded units of friction are shown. The reached level of characteristic and prospects of nanostructured materials are presented. The problems of the composition and nanostructured materials science are characterized .It is shown,that work in the field of composition and nanostructured materials are actively conducted in the practically all industrial developed and developing countries. Cast Mg alloys have been successfully used where the reduction of mass of a structure is of great importance. Special properties of Mg alloys in combination with the low density (1800 kg/m3) enable them to be used in aerospace technology, various types of units, in the production of optical instruments, radioelectronics, etc. As Mg alloys are 1.5 times lighter than Al alloys, 4 times lighter than steel and cast iron, their use provides a 25-30% reduction of product mass, which is especially noticeable in shaped castings. At VIAM they have developed over 17 grades of cast Mg alloys, special attention being paid to the development of melting and shaped castings production process. The new investigations in this field are directed at creating high-efficiency resources-saving processes assuring quality of complex Mg castings. Very promising is the melting and casting process that ensures the production of new high-purity ВМЛ18 and ВМЛ20 Mg alloys by treating the melt with special master alloys. 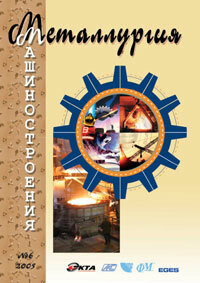 In the laboratories of the Vladimir State University they have developed a composite Al-Si-SiC alloy with up to 5% SiC. It is produced by immixing 3 to 30-?m SiC particles into liquid aluminum alloy on a special unit, and then it is cast by liquid forging. The alloy has high antifriction properties: a low friction coefficient f=0.005 to 0.01 and withstands loads of up to 18-20 MPa. The presented article deals with the research on chemical composition, structure, mechanical and special properties of iron-carbon-manganese alloys. Basic complexes have been chosen which allow to develop special irons and steels for castings working under conditions of abrasive and shock-abrasive wear. The work investigates the differences of cast irons produced from steel scrap from those produced by the conventional method. The effect of charge materials and their heredity on the structure and properties of cast iron predetermines the dependence of the mechanical properties of products on the kinetics of changing of the shape of graphite inclusions when it is heated. The work investigates talcum chlorite - a natural material, owing to its unique properties - ease of processing, durability and high heat capacity - being widely used in the production of building materials, metal making and other industry branches. A process flow sheet for producing electroslag remelted hollow 2.5-ton ingots O 610/ O 190 mm from cast consumable electrodes of grade 15Х12Н2МВФАБ (ЭП 517) heat-resistant steel is proposed. Information on the chemical composition, structure, mechanical properties of electroslag remelted grade ЭП 517 heat-resistant steel is given. The dendritic chemical inhomogeneity of a hollow ingot from ЭП 517 has been studied. The availability of using hollow ingots from other grades of heat-resistant steel is discussed. The necessity of investigating the effect of austenitization conditions before oil quenching and low bainitic hardening on the transformation kinetics is shown. Conditions with optimal mechanical properties should be chosen, and the process of heat treating wire of 70ХГФА steel should be finished off.